This book presents theories and clinical practices for dealing with children diagnosed with pervasive developmental disability or PDD. These are children who have a wide range of disabilities that affect their participation in even the most routine events of daily life, such as eating, dressing, bathing, and so on. Unlike many who are diagnosed with classic autism, however, these children seem to have normal social behavior, normal physical appearance, the ability to learn, hear, see, and move their bodies at will—in other words, none of the well-known reasons that cause autistic and other children to develop differently. These children have the use of all their senses, but their brains are unable to process the information that is fed through them. While much new research is being done in genetics and neurobiology to explain why something in these children has gone fundamentally wrong with their development, clinicians and therapists who deal with them on a daily basis have needed to develop practical therapies based on how the children react to their environments. Movement and Action in Learning and Development suggests that when therapists plan treatment strategies, children's experiences and interactions with the world should be given the same consideration as the limits of their biological makeups. Too often children diagnosed with PDD are lumped into therapy groups for the classically autistic, where the focus tends to be on the distance senses—hearing and vision. 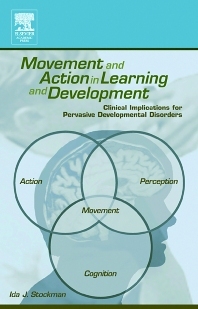 Case studies presented in the first half of the book suggest that for children with PDD, there is a disconnect between the brain and the tactile-kinesthetic senses that involve body movement and physical interaction with the world. Movement, in turn, seems to be connected to perception, interpretation of the world around, and ultimately, the acquisition of knowledge. For children with PDD, "normal" learning seems to be limited not only by their tactile-kinesthetic sense but also by the lack of collaboration between all the senses. The second half of the book demonstrates how these new theories translate into clinical practices. Speech-language pathologists, occupational and physical therapists, psychologists, special education teachers, as well as other education and medical professionals who deal with children and adults with pervasive developmental disabilities. I.J. Stockman, Introductory Commentary: A Theoretical Frameworks for Intervention with Pervasive Developmental Disorders. H.L. Pick, Jr., Interrelation of Action, Perception, and Cognition in Development: An Historical Perspective. E. Thelen, The Central Role of Action in Typical and Atypical Development. J. Kaas, Plasticity of Somatosensory and Motor Systems in Developing and Mature Primate Brains. J. Langer, Constructive Manipulatory Action and the Origin of Cognition in Human and Nonhuman Primates. K. Nelson, The Event Basis of Conceptual and Language Development. L. Bloom, The Integration of Expression into the Stream of Everyday Activity. F. Affolter, From Action to Interaction as Primary Root of Development. W. Bischofberger and F. Affolter, Guided Interaction Therapy: Principles of Clinical Intervention. D. Hayden, PROMPT: A Tactually Grounded Treatment Approach to Speech Production Disorders. I.J. Stockman, The Multiple Faces of Clinical Efficacy. I.J. Stockman, Potential Challenges to Clinical Practices and Research. Ida J. Stockman, Ph.D., is a professor in the Department of Audiology & Speech Sciences at Michigan State University. She is a certified speech-language pathologist and Fellow of the American Speech-Language-Hearing Association. She has been affiliated with the Affolter clinical research team since the early 70's. The Michigan State University Symposium on Movement and Action in 1995-96 were among the professional service contributions that led to Distinguished faculty awards from Michigan State University and the Michigan Association for Governing Boards of Institutions of Higher Learning.